Some people don’t need a specific work space at home. A recent study found that 43% of employed Americans spent at least some time working from home. And it seems that the trend will continue. 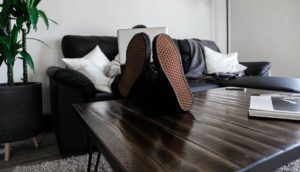 One reason is that working from home seems to improve productivity and cut turnover; two big cost issues for businesses. There are pros and cons, but when it comes down to the money it seems to make sense. Businesses can save on office space and other expenses. Workers save on commuting costs and a few other things. That will drive the continued evolution. Say you are working from home or will in the future. How do you maintain your efficiency? The first question that often comes up regarding working remotely or from home is the hours. If you’re working on your own there is the seeming benefit of having more flexibility. That’s a plus. Even for businesses. You want the most productive employee possible. If they work better in the morning or at night what difference does it really make? I’ve found that I still basically work the same hours. I used to work 7:00 to 4:00 in the office. Now I work 7:00 to 4:00 at home. Pretty much the same routine. My wife keeps her pretty similar hours. We both used to work at the same place and they were flexible on the hours. You could start at 6:00 if you wanted or you could come in at the usual 9:00. I think at home most people will fall into their normal place if they have flexibility. I know some jobs can’t allow for certain options, but if you can it’s worth it. And if you’re an entrepreneur, what I find is that there are normal working hours, but you’re pretty much “on” all the time. Responding to emails at 4:00 AM or 11:00 PM. All kinds of things. So it’s pretty much a moot point anyway. Another question is the work space. Should you setup an office so you can have work space and home space? Again, I think for the most efficiency it goes back to the individual. Some individuals need separation. But I think others can work on the couch or at the kitchen table or in their own office. My wife likes her own office space. I can pretty much work anywhere. I can work in an office, but I can get just as much done somewhere else. We’ll get to distractions next and that plays a role in the work space question. You have to be self aware if you have the flexibility with your work space. If you need it you need it. If you don’t then you should be fine. There can be lots of big and little distractions with working at home. I think it’s the little things like tidying up around the house or taking a little extra time to make something delicious for lunch. But the more I thought about it the more I realized that there can be just as many little distractions in the office. Coworkers coming in to chat. That kind of thing. But it is important to recognize distractions. Audit your time every 3-6 months. Take a day to really dive into every 15 minute segment of your work day at home. Obviously there are benefits to working for say an hour and taking a break, but sometimes you can discover potential issues cutting into your efficiency. Recently we have more information on work efficiency. One study found that it’s best to work for 52 minutes followed by a 17 minute break. Oddly, once I had the flexibility to work whenever I found myself kind of doing the same thing. For example, I had this title ready to go. I’ll write the post in about ~50 minutes. Then I have an article or two lined up in Pocket to read as a little break. Give the brain a rest. The trick is that when you’re at home to find your flow. I find that if I start getting really involved in something for 2+ hours that I get diminishing returns. Find that point of no return and use that to set your breaks. Then obviously the other way you need to still get your work done. More on this in #6. This is where technology has really made it possible to work from home. Email, Skype, Secure Cloud access and more. You can really work from anywhere. You can pretty much get setup even with basic technology right in your home. One note here that I would add is that you don’t need to have anything too crazy as far as tech or software in order to work from home. I have a smartphone, free Skype and Google Drive. Not expensive. Works just fine. There is software for everything today. I haven’t found that any of it really saves time. Let’s end with a big one. You have to be accountable to yourself when you’re working at home. But I also think that you really have to be accountable even if you’re in an office. I’m a believer that fraud always fails. If you’re in the office and kind of using tricks and gimmicks to make it seem like you’re being productive that it will eventually bite you at some point. And if you’re not being accountable in the office you’re probably going to get fired. The same will happen at home. If you’re an entrepreneur you don’t have a choice. No accountability means you’re out of business. There really are no big secrets for working efficiently from home. The big thing is to be self aware of how you work best. Then making sure you have the flexibility to work within your personal best frame and space. And then it just comes down to accountability. If you’re not getting the job done you’ll suffer, but if you’re driven and accountable you’ll probably work really well from home.